We are excited to announce that Techno FAQ Digital Media (henceforth stylized as Techno FAQ) has completed the acquisition of Tekh Decoded in December 2018. On 9th January 2019, the management and administration of Tekh Decoded has been handed over to the Techno FAQ staff. You might have a lot of questions regarding this acquisition, and what it means to you as a reader or as an advertiser. You might also have questions about our future, and what this acquisition means to us. In this blog post, we’re going to answer all your questions and explain them in the most transparent way possible. Steve Jobs’ last most Ambitious Project, The New Apple Campus is now a Reality! Best 5 Pokevision Alternative to Locate Rare Pokemon! However, as time passed, our co-founders discovered newer interests and went on to work on new projects. With limited time in their hands, the decision to continue maintaining Tekh Decoded was a hard one to make. For a long time, our co-founders looked for people who would continue operating the e-magazine. With the search for the perfect team becoming tedious, in Q2 2018, we came in touch with Techno FAQ Digital Media, the team behind the successful B2B tech blog TechnoFAQ.org, who offered to acquire our blog and take forward the objectives envisioned by our co-founders to the next level. Talks began in Q3, and both parties approved the acquisition in December 2018. The transfer of web assets and change in management was completed by 9 January 2019. As of now, Tekh Decoded is 100% owned, hosted and managed in-house by Techno FAQ. The answer to this cannot be merely expressed using words like “not much” or “a lot”. The changes brought about by this acquisition is unique to us alone. To start with, you, as a reader, will notice a lot of changes in the user experience while browsing the site. The most significant ones are listed below. Tekh Decoded is now hosted on Techno FAQ’s centrally-orchestrated robust private cloud platform, which means all the performance benefits of TechnoFAQ.org are now available on Tekh Decoded. You should see a noticeable reduction in page load times compared to 2018. If you are using a browser that has HTTP/2 server push enabled, the performance gain will be even more prominent. Tekh Decoded will have the same reliability benefits of TechnoFAQ.org which means that our site will have far lower and fewer downtimes from now onwards. Tekh Decoded now has improved security. Our domain zone is now DNSSEC-enabled, and we’re already enforcing 100% HTTPS with support for TLS 1.3. This means that not only you can read our articles privately (privacy and confidentiality) but also are connected to the right Tekh Decoded (authenticity). Tekh Decoded is also IPv6 enabled. This means if you are browsing on a dual-stack or IPv6-only ISP, you will notice even more speed improvements. The structure of site menus have been renovated and it is now easier to browse the site. Coming to the essence of Tekh Decoded, we’re not altering anything. Tekh Decoded will continue to be the site you have always been familiar with. Under the new management, we are taking our blog to the next level. 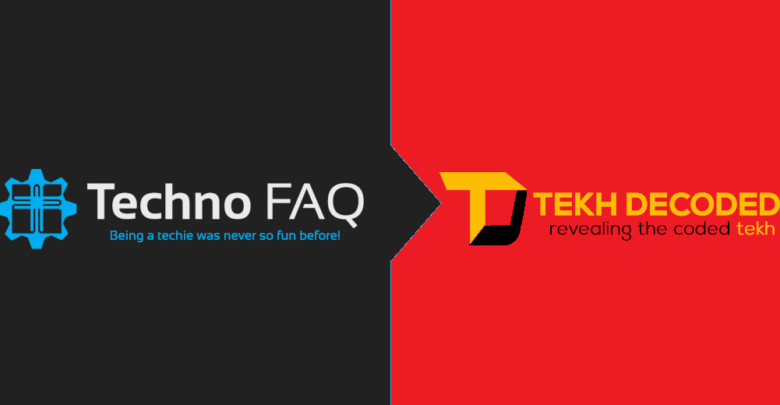 With Techno FAQ’s years of experience in digital journalism, we plan to leverage it to deliver not just more, but also quality content to our readership. We also look forward to collaborating with individuals and companies to bring the best of modern tech news, DIY guides and tech reviews to your fingertips. The answer to this is “very significant”. If you have already advertised or are planning to advertise on TekhDecoded, then we recommend you to read this section very carefully. There are major changes to how advertising will be handled at TekhDecoded from now on. The following changes are now in effect after the acquisition. We have refreshed our available advertising options. Please check our advertising page for more information. As an advertiser, you can now rest assured that your communications (emails, chats, etc.) with us are safe and secure. We now run our email and communications services in-house on our private cloud with close to zero dependence on third-party platforms and encrypt messages stored on the disk as well as in transit on the network with strong modern cryptography. We now also follow strong privacy practices and no one except our personnel have access to privileged information (like terms of advertising, future sales, ad slot bids, order history, etc.). Additionally, we will not sell or hand over your private information to anyone. Advertising payments processed by PayPal or our card processor will now have ‘Techno FAQ’, ‘TECHNO FAQ’, ‘TECHNOFAQ’, ‘technofaq’ or ‘Sunit Kumar Nandi’ in the merchant identifier field in either your card statement or invoice receipt. If you do not see any of these terms anywhere in your transaction slips, it could be theft or a scam. Please do not proceed with payment and inform us at [email protected] immediately. We do not have any authorized official resellers for our ad slots after the acquisition. If you are placing advertisements via a reseller or an outreach agency, we will not handle your case directly. If you have any requirements or disputes, please contact the agency you’re working with, and then let them contact us. We will only handle disputes for orders directly placed with us. Any long term ad placements (especially text link ads) placed before 2018 are no longer provided with any warranty. Techno FAQ Digital Media does not provide placement guarantees for more than a year on a one-time payment basis on its websites. Any pre-existing contract that provides placement guarantee for lifetime or more than a year on a one-time payment basis is henceforth treated as null-and-void, and no refunds will be provided for the same. At Tekh Decoded, the new joint management brings about a lot of positive changes. Tekh Decoded now benefits from the more seasoned and experienced team who can help realize the goals set by our founders. On the other hand, Techno FAQ Digital Media gains experience in running a blog targeting a different audience than it usually does. The combined Tekh Decoded and Techno FAQ team take its first steps into forming a new Internet media network. It is a win-win for both the parties. We would like to say thank you to our entire community for being part of the evolution, and for celebrating this important milestone with us. We look forward to our continued growth together. I wish you all the fortune with the future ventures of tekhdecoded, and I am sure it is in good hands with TechnoFAQ. I have corrected your name.